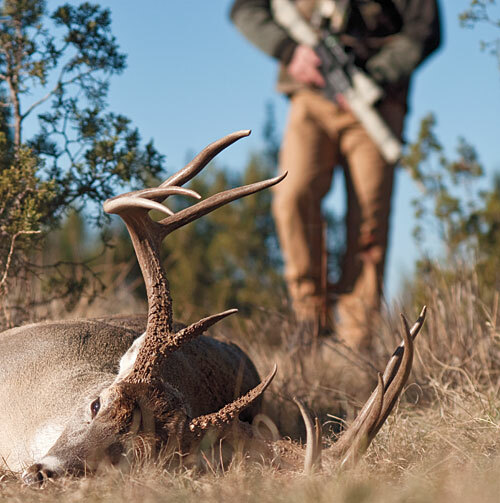 AR-styles rifles have broken out of their role as combat arms and predator rifles, and can be seen in almost any hunting camp in the U.S.
One thing that is getting a lot of attention these days from sportsmen is the use of tactical rifles for hunting. Except where predator hunters are concerned (those boys were quick to recognize some of the advantages the rifles gave them in shooting smaller game), the sight of an AR-15 in camp was more of a novelty than a practice. But in the last few years, all of that seems to be changing. Today, as I travel around the country, I see more and more of these cool guns coming out of gun cases and safes at the different camps I stay in or visit. Hunters are finally embracing this gun for what it is--a darn fun gun to shoot, and one that is very practical for a lot of hunting situations. I will be the first to admit that, while I've never been against them, tactical rifles simply weren't something that I was exposed to very often growing up hunting in the South. Every once in awhile an old buddy who might have been in the service would bust one out of his truck and we'd go down and shoot targets or something like that. It was always a good time, but in my mind I still associated the rifles with combat and not the hunt. The closest thing I saw hunters use along those lines was an old Remington 742, Browning BAR or some other semiauto rifle that was good for deer. As a result, I never really appreciated what ARs were for outside of combat. Obviously, all of this changed after Remington came out with the R-15, soon followed by the R-25, both AR-style tactical hunting rifles. I was asked if I would like to use one on a hunt, and when I did use it, it was like a light went off in my head. I had forgotten how much fun it was to shoot these types of guns, and because they were being offered in calibers beyond the relatively small .223 (an ideal cartridge for smaller game), they were capable of taking large game, which is what I truly like to hunt. With a good AR, you have many opportunities to make a good follow-up shot if it is needed, because regardless of caliber, the guns have minimal recoil. This makes them easy to handle and even easier to stay on target until you know the job is done. Believe me, if that first shot turns into a warning shot, there is not a better gun to have in your hands to make that follow-up shot than one of today's top ARs. The accuracy and dependability of an AR are exactly what a hunter is looking for in a gun. Proven by the military, which has used them in the M16 military version since Vietnam, these guns are used by many long-range competitive shooters in matches at Camp Perry every year. The operating system is extremely simple and has few moving parts, so there is less to jam up or become a problem. They are also easy to break down and clean. A couple of years ago, I enjoyed the opportunity to do a hog hunting show with my son, Mason, where we used a Remington R-15 in .223. I was familiar with the gun by then and thought it would be fun to shoot and show how practical it was to hunt with. We hunted hogs over a couple of days and killed a few on camera. It was Mason's first chance to hunt with a rifle like that, and watching him use it made me realize what a great gun this can be for kids or other smaller shooters. There was little recoil, and with the collapsible stock, I could adjust the length of pull perfectly for him and then turn right around and adjust it for my arms and use the same gun. Obviously, because it is a semiautomatic, special care needs to be givaen in going over safety when using one, particularly with a new shooter or a kid. You want to be sure they realize that after they pull the trigger once, they are still holding a firearm ready to fire until the safety is put back on, but the same principles of gun safety still apply no matter what rifle or shotgun a hunter is using. Throughout history, soldiers have returned home from wars and picked up the same type of guns they had become familiar with in battle and taken them into the woods for hunting. The AR is no different, and with so many of our soldiers--many of whom also hunt--valiantly protecting our interests in places such as Afghanistan and Iraq, no doubt the AR will remain a visible fixture on our country's shooting ranges and in hunting camps for many years to come. 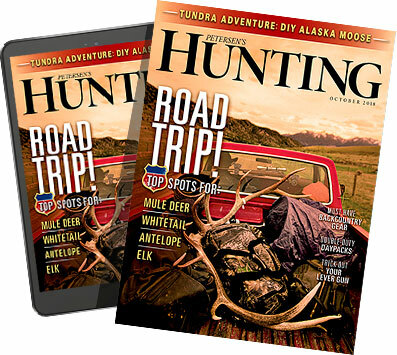 Some hunters are still reluctant to embrace these modern rifles and continue to prefer the classic stylings of more traditional arms with bolt actions or levers, wood stocks and checkered fore-ends. That is fine. But don't be so quick to knock today's tactical guns. The Second Amendment, after all, isn't about hunting, it is about our rights as citizens to own guns necessary for our protection. It is not up to us as individuals to define what a hunting rifle is or isn't any more than we want anti-gunners and anti-hunters making those same decisions. In the end, ARs are fun to shoot, they are accurate and dependable, and they are versatile in the field--everything a sportsman could hope for and expect in a gun he will use for hunting.